The Planning Guide to Piping Design, Second Edition, covers the entire process of managing and executing project piping designs, from conceptual to mechanical completion, also explaining what roles and responsibilities are required of the piping lead during the process. The book explains proven piping design methods in step-by-step processes that cover the increasing use of new technologies and software. Extended coverage is provided for the piping lead to manage piping design activities, which include supervising, planning, scheduling, evaluating manpower, monitoring progress and communicating the piping design. 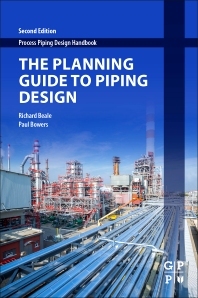 With newly revised chapters and the addition of a chapter on CAD software, the book provides the mentorship for piping leads, engineers and designers to grasp the requirements of piping supervision in the modern age. Paul Bowers is a senior piping designer with over 30 years of experience working on major process plant projects including refining, cryogenics, pulp & paper, petrochemical, industrial gas installations and SAGD as well as CAD/engineering automation administration. As a software and technology enthusiast Paul believes that machines must adapt to humans and not the other way around. Currently residing in the Montreal area, Paul has been owner of the PipingDesign.com domain since 1998 is currently webmaster / web developer / "Digital Administrator" and a director with the Houston-based Society of Piping Engineers and Designers as well as founder and past president of the Calgary chapter of the same organization.